The veggie chip strikes again! After getting my fill of kale chips, I've moved on to a baked zucchini variety. I first tried these addicting little crisps at NoRTH, and ohhhmyyygurr they are so tasty and easy to make.You don't have to ask me twice to indulge in this sort of guilt-free snacking, that's for sure. My only word to the wise when making zucchini chips? Cut them as thin as you can, and slice up more than you think you'll need. They shrink a lot in the oven! salt or other seasoning of your choice (I made a batch with garlic powder and chili powder). 1. Preheat oven to 225 degrees Fahrenheit. Line a baking sheet with parchment paper, and spray with canola oil. Set aside. 2. Slice zucchini into thin medallions, about the thickness of a quarter. I used my slicing blade on my food processor. 3. Lay out slices on prepared baking sheet, and spray tops lightly with additional cooking spray. Sprinkle with seasonings of your choice. Don't sprinkle on too much seasoning - it's always better to add more later than overdo it. 4. Place in preheated oven and bake 45 minutes. Rotate baking sheet, and bake an additional 30-50 minutes, until chips are browned and crisped to your liking. These are best eaten within a couple hours of removing from the oven, as they start to get chewy if left out. Thanks for sharing the recipe. These look delicious! I'm always looking for healthy snacks. Liquid sauces and marinades can also be used to spice them up. 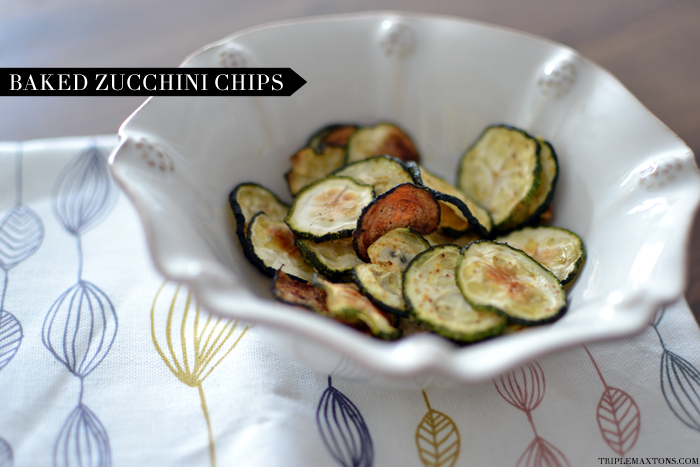 Hot mustard chips and chili-lime zucchini squash chips are excellent. would it still be on the healthy side by eating it with hummus ?